Collaboration is a critically important aspect of successful modern office environments, but focus will always rank higher as a means of building effective and productive workplaces. Maximizing office productivity with a focus space allows employees to independently dedicate attention and concentration to tasks and projects in a way that can’t be replicated in the hustle and bustle of offices shrouded in non-stop socialization. Innovative and leading organizations the world-over are busy trying to support employees who are adapting to the open office concept in an effort to retain top talent, encourage collaboration, and boost creativity and efficiency. The concept of open offices is geared towards increasing employee satisfaction and job fulfilment, but the open office is also sometimes criticized for an increase of distractions, eliminating much-needed privacy, and reducing overall employee motivation. Helping staff pivot around a newly integrated open office concept lies in the ability to find common ground with employees, identify with spatial shortcomings, and improve the work environment. The issue with open concept offices is: research shows that many employees don’t like them. This means adopting adaptive strategies to optimize and tailor the work experience through an open concept office will be key to transitioning to the new space and boosting the employee experience. One of the benefits employers are eager to cash in on, is an increase of quick communication that speeds up the workflow of the entire office. This boost in efficiency and openness reduces the time it takes to find the info employees need to do their jobs, makes collaboration instant, and is supposed to maximize the chance for encounters that foster discussions relevant to the company cause. But – and this is a big but – increased communication must start with a different type of communication before all of these glorious benefits can come your way. 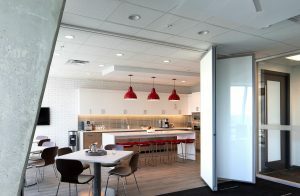 Adapt to an open concept office space by getting everyone together and communicating the perceived hurdles and pain points employees may have with the new open space, and discuss ways that can help the entire team feel heard and respected. For example, lay out some ground rules for how to work as a team with differing working styles in an open space by coming up with an open block of communication time, rather than a free-for-all during the whole day. Alternatively, come up with a universal office-wide symbol for privacy, like a flag or another visual cue that the individual needs privacy at this time. Ground rules for distracting and unwelcome behaviour is important so employees know ahead of time the way that benefits the majority of their peers – things like loud, off-topic discussions, music, constant personal phone notifications, etc, are all issues that can be addressed to test out a proposed ban and/or set of rules. This type of increased communication in the form of a formal discussion of boundaries and working styles is first in your journey to adapt to an open office concept and harness the benefits of a boost to communication. Open office plans are critical for teams who need to find ways to respond to change and support shared goals through collaboration. From an employee perspective, the open office concept is a wonderful weapon that helps combat the time-tested obstacles of cubicle and/or private office based spaces. Open space offices support shared goals because they unify employees in one room, under one roof – so to speak – working towards a collective goal. To adapt to the new open concept space, employers may be wise to evaluate and formulate new teams of individuals who’s working styles are complementary, creating an optimized environment for support, efficiency, and goal-based work. Open office concepts help teams that need to quickly and efficiently exchange information throughout the day in short interactions. The open concept corrals employees working together in one common space and places collaborative information right in the neighbours seat beside them. This means an accelerated working environment that minimizes wait times for data and shared information, and a boost to the availability of help, and new ideas. When help is instantaneous, employees feel empowered and confident in their approach to new and complex goals, and can also benefit from observing and utilizing the skill sets of their colleagues in such close quarters. One of the major problems with the changeover to an open concept office space is, there’s some considerable research that demonstrates employees don’t want to embrace the change. In fact, over 70% of offices in the US today are open concept, according to the International Facility Management Association, so there’s evidence to support that employers just don’t care about how employees react and perform under these new parameters. Why? Open offices are cheaper to create and maintain, and with time, can create great office culture and performance. So, the answer to bridging the gap between reluctant employees and employers eager to make the change, is a formal, excited discussion about the whole idea before it takes place. Get the entire team together to talk about the benefits you’re planning to implement- maybe a cafe style collaborative working space, or an open desk corral that is specifically designed to use the latest technology, etc. These perceived perks are great ways to discuss the vision for your new open concept office plan before knocking down walls – and represent a good way to head off any negativity or reluctance from staff. Many companies and organizations do well by embracing a positive attitude from their internal leaders to communicate ideas about a new office space to their employees. Being enthusiastic brings new meaning to the change, and can help employees feel satisfied and optimistic about the information that’s relayed to them. The Harvard Business Review found in a study investigating the transition to an open concept office, that when business leaders were positive about the change, company identity flourished and were more likely to embrace the new office space. In the study, many employees were initially worried their main modes of working would be threatened – independent working with minimal supervision and disruptions – but when their internal leaders expressed positive messages and welcomed the move, most workers felt reassured about the change. Changing working environments is hugely dependent on how workers relate to their surroundings; changing the dynamics of a working environment can be really negative when workers identities are removed from the space altogether. The HBR also found in their study that when employees were encouraged to make the new space their own, identity was left intact and remained positive. These improvised and collaborative space designs ended up being more colourful and included personal touches – some teams even felt compelled to arrange desks to help meet their needs as the space around them changed, fostering a renewed sense of control, and freedom. When trying to adapt to a new open concept office space, encourage your staff to make the space their own by trying a few different things: layouts, desk configuration, furniture placement, colour, the inclusion of plants, etc. When you give creative control to your employees, the transition from traditional office space to new open concept office space will be much easier, and more welcome. Adapting to the open office concept also means understanding that it doesn’t work for everyone. Playing to the strengths and hurdles you know exist within your staff is key to finding ways to adapt to the open office concept. When in doubt, you can work with a commercial interior designer on your workplace strategy and build a framework for an improved open office concept. An open concept office is a beautiful thing — studies show a wide open space that supports collaboration and cooperation on a large scale cannot only help boost employee productivity and efficiency, but overall happiness and well-being as well. When offices combine a large number of people in a single space, there’s inevitably going to be more noise that accompanies working together. This can be accentuated even more when employees resort to raising their voices to get their point across – creating a slippery slope for noise control efforts. Cue office acoustics — powerful sound deadening solutions that help dampen and reduce the reverberation of sound while preserving the open concept layout of an innovative and modern open plan office space. Optimizing the sound quality of an open plan office environment is priority #1 when enlisting the help of improved office acoustics – but a close second is upholding a design-centric aesthetic that supports a cool, modern office that prioritizes workplace satisfaction. Having an open concept space doesn’t mean that your office won’t need a small space dedicated to individual conversations and moments of solitude. Employee lounges or meeting spaces are worth considering when investigating the addition of acoustic panelling. As a general rule, hard surfaces reflect sound, while soft surfaces absorb sound. Having an exposed brick wall in your office – while that’ll score you major points on the style charts – perpetuate the reverberation of sound energy. Covering them up, at least in chunks with acoustic wall panels, helps control and limit the movement of sound in wide open spaces. Acoustic tiles can be installed on walls in seating areas that prioritize meaningful communication. They come in a variety of acoustic materials that help dampen the reflection of sound in open spaces and create customized and stylish accents that add to the overall design aesthetic of your office environment. They can be tailored to match your brand identity, its colours and shapes, to reflect your organizational mantra and logo. For situations that call for a fixed workplace solution, modular screens or erectable walls can give instant privacy and improved sound control to separate certain sections of your open plan office for more optimal concentration. Further, they can be left in place, or taken down and moved elsewhere, contributing to the open concept design and providing flexibility for employees who like to move around the office depending on their mood. Plus, when you need to open up the space, they can be stacked away neatly. The very ideology of an open concept office is to empower employees to freely set up their ideal workstation wherever they please. To do that, modular spaces and furniture is critical – adding an acoustical aspect to office furniture is a powerful and effective way to target both sound control and office flexibility. Acoustic furnishings are purpose-built with acoustical materials and integrated sound absorbing panels precisely where they’ll be most useful – right in the thick of the action, while eliminating impediments and interruptions to the office design itself. Everything from chairs, storage/filing solutions, desks, bookcases and shelves can easily be purchased or modified to include acoustic-sensitive materials. Commonly known as baffles or clouds, ceiling mounted acoustic panelling is a great way to help reduce the reverberation of sound in spaces with tall ceilings, especially if your particular office space doesn’t have much to offer in the way of surface space to install classic panels. Baffles typically are mounted downward so they can hang lower into the space, and so they can be installed with lighting in mind. Baffles are great solutions to sound pollution in an office because they can help minimize excess sound while not relying on the addition of walls that would otherwise crowd your open space. The ground we walk on plays a huge role in how sound is able to transport itself. Imagine for a moment, being on a deck on a lake somewhere. There’s no breeze, and the water is flat as glass. There’s nearly a guarantee that you’ll be able to hear the conversation of the group across the lake, because of the way sound is able to travel in such a controlled environment. Open concept offices are much the same in that the flat, hard surface of the floor acts similarly to the lake – sound is able to easily traverse across it. Area rugs, carpeting, and different types of sound-sensitive flooring material, like cork for example – offer fantastic sound proofing for more beneficial office acoustics. While most acoustical additions like the ones we’ve discussed work towards the elimination of unwanted sound, these innovative systems are responsible for the addition of sound created via specialty digital generators and distributed through hidden speakers within an open concept office or other environment to reduce distractions and/or provide privacy. Commonly referred to as white noise, or pink noise, noise masking systems produce broadband random sounds that conveys no identifiable sonic information – like dialogue, or a glass breaking, for example. Open concept offices routinely develop a certain culture that revolves around a physical and psychological identity that we associate with partnership and collaboration. This aura of energy is responsible for the creation of company identity that all great brands strive for. While the open concept office space are perfect for opening the communication and partnership floodgates, they’re also responsible for bringing their fair share of unique obstacles – namely increased noise. To combat unwanted sounds within the office, an investigation into the benefits of how office acoustics can play a beneficial role to optimizing productivity and happiness is always a good idea. The modern workforce spends significant time in their offices, and this can have less than profound effect on the human body. Designers and business owners are taking note, and programs dedicated to health and wellness have infiltrated many office perks. But there’s one more step designers are taking – optimizing entire buildings to constantly address issues of human health.